The United States Congress designated the Gearhart Mountain Wilderness (map) in 1964 and it now has a total of 22,587 acres. All of this wilderness is located in Oregon and is managed by the Forest Service. At 8,364 feet, Gearhart Mountain stands higher than all the other volcanic domes in this Wilderness of high mountain meadows, cirques, and U-shaped valleys. Picturesque rock formations cap most of the ridgelines, offering sweeping views of the artistic sculpturings of long-vanished glaciers. Lodgepole pine, ponderosa pine, whitebark pine and white fir dominate the vegetation. There is only one lake in the Wilderness, Blue Lake. The Wild and Scenic North Fork Sprague River sweeps past the northern boundary of the area. The main thoroughfare, Gearhart Mountain Trail, provides about 13 miles of access for foot and horse traffic along the main ridge and to the well-visited shores of Blue Lake. Joining the main trail from the southwest is the 3 mile Boulder Creek Trail to the wilderness boundary and the 3.5 mile Deming Creek Trail to the Forest Trailhead. 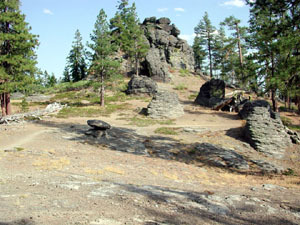 The wilderness has fairly gentle terrain and open forestland with beautiful mountain meadows with lush green ground cover, stands of aspens, and multitude of spring flowers that invites visitors to explore all corners of the wilderness The snow starts in late September and may linger until early July. Snowshoeing and backcountry skiing are increasingly popular sports here. Planning to Visit the Gearhart Mountain Wilderness? How to follow the seven standard Leave No Trace principles differs in different parts of the country (desert vs. Rocky Mountains). Click on any of the principles listed below to learn more about how they apply in the Gearhart Mountain Wilderness.